Yes, I turned 60 last week. Half my life has been spent in talent acquisition. When I began my journey, IBM 8088 PCs weighed 42 lbs, “social” and “media” weren’t connected (thank goodness), and a large amount of sourcing revolved around “procuring” corporate directories and dialing for dollars. There were no purple squirrels; 3×5 index cards (color-coded with stick-on dots), Rolodexes, and file cabinets were the Applicant Tracking Systems of the day. Analyzing databases was just in its infancy: I know, because I was writing JCL code to download large – 1MB – DB2 files from IBM mainframes into VisiCalc and Lotus 123 (the developers of both were friends), then wrote more code in a precursor to R to analyze and visualize the data. With all the reverence paid today to AI platforms in recruiting, I still harken back to the mid-1980s when I was developing expert systems using a combination of a revolutionary platform and native code, and having coffee with Marvin Minsky in his lab at MIT. Yep, building relationships with college professors was a thing back then. Along the way, I learned, I succeeded, I failed, I made career and personal decisions that still make me cringe. 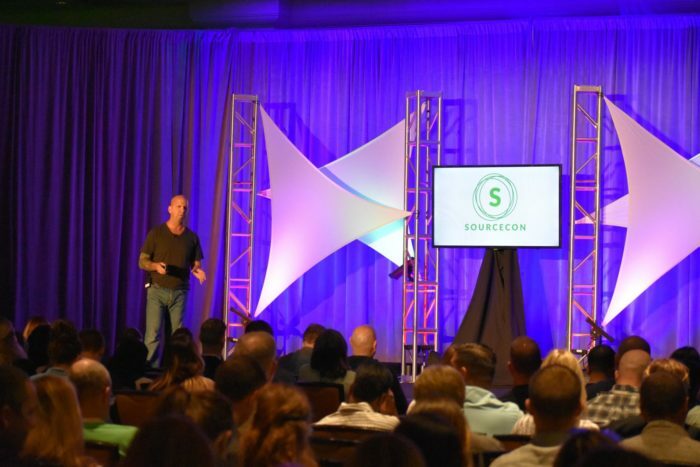 I also found an incredible community called the Electronic Recruiting Exchange whose founder now not only enjoys sitting in the darkest corners of conferences called SourceCon and ERE but is also no longer afraid of me taking the stage. I also met some of the most intelligent, giving, and abjectly odd people I know – so many who are now very close friends. And dang, if I didn’t learn a few lessons along the way. At least half the people in your life will mispronounce “Boolean”; at least 10% of the people who claim they are Sourcers will too. Don’t trust statistics unless you’ve read the research methodology; if you don’t know about research methodology, my favorite book on the topic is this. Give back more than you receive – yes, there will always be someone who will learn from you. The more logical and wider the funnel, the less likely you’ll miss something really important. The chances of you finding that one “perfect résumé” that everyone else has missed is a pipedream. You will almost always go into “golden retriever head tilt” mode when with hindsight, you realize how simple your best sourcing solution was. You don’t need every Chrome extension that Dean Da Costa speaks about to be a great Sourcer. Sometimes it’s just better to attend the conference then it is to scrape the attendee list of that conference. Hiring managers are really scared of making a bad hire – really effective sourcing is like giving them hugs. An ATS is only as good as the person using it. Take hiring managers out of the building for coffee. Take the hiring manager’s senior people out of the building to a different coffee house. If the hiring manager can’t describe what “it” is, have them draw a picture of their environment and systems – this is guaranteed to get them to think more clearly about their roles. Visit the conference exhibit hall early in the morning after the first day it opens – and before it officially opens: Great time to walk around and pick up the business cards left out at booths. You won’t get anywhere without failure and screwups. There’s no such thing as an expendable connection. You can’t source nor recruit outside-the-box people without using outside the box methods. Sourcing can take place anywhere, anytime – when you’re shopping, working out, traveling, or at a swim meet. The two most important social tools are the telephone and the handshake. Do a “working with recruiters” talk or panel at non-recruiting conferences. There is nothing wrong with the low hanging fruit on LinkedIn; always start sourcing with the Easy Button. Hiring managers can make great Sourcers. “site:edu inurl:research” can help you find scientists, subject-matter experts, technologists – and frankly, anyone who thinks. Two very important sourcing skills are…reading comprehension and scrolling down a page. Always apply for the job for which you’re sourcing – how was that candidate experience? No one is ever perfect for that job of yours before you speak with them. Whenever you attend a conference, walk around the venue looking for other conferences. You never know when you can find an attendee list. When at a conference be the first one there – to take a picture of the badges laid out all nice on the registration tables. Read wedding announcements in the newspapers or online (notice how occupations are listed). When taking an elevator, turn around and introduce yourself to people on the elevator; people are almost relieved to have a chat. Community boards at supermarkets are the real deal for sourcing; really bold tear-off sheets for your openings are guaranteed to create a buzz. Need targets? Office buildings have tenant directories in plain sight. When newspapers are delivered to buildings in the morning, the recipient – and their title – are usually printed in the label. Engineers use the same handle on dating sites that they use on tech sites. When visiting your usual table at the coffee shop (of course, the one near a competitor), tape a “I’m hiring” sign to the back of your laptop. Never bypass a LinkedIn profile that contains only a person’s name and title because it doesn’t have enough “meat” in it – since almost everyone else will, you’ll have a leg up. A “bad” resume does not imply that the person will be an unsuccessful employee. Cyberstalking – um, sorry… “researching” the hiring manager before your intake session is a sure-fire way to get them to unleash a healthy dose of job performance reality rather than a laundry list of task or skill requirements. If your company exhibits at non-recruiting conferences, beg, grovel, or bribe your way into attending – as part of the booth crew. Duh. Call your friends in the community every week (video calls are also fine). Buy funny tee shirts that cover the roles for which you’re sourcing and wear them to related meetups and conferences (great for assessing “sense of humor”). A/B test your messaging with the people you covet (because it doesn’t matter if other Sourcers and Recruiters like it). site:scribd.com “attendee* list”|”participant* list”|registrants|”member* directory”|”member* list” – it’s worth the price (and listen to Tangie… It’s really okay to pay for things). When traveling via airplane, get to know your row mates. Hotel bars are really great places to meet your next hires. Ask members of the group where the new person will sit about the blogs they regularly read – then mine the Comments for intelligent interactions. Combine Gmail alerts with your favorite Booleans – gifts that keep on giving. No association chapters in your area? Start one. Stop complaining about your crappy systems and find hacks to make them usable. You won’t find more sources of people by simply working harder – you must ask for help. If you’re a Sourcing Leader, switch roles and put your senior person in charge for one week; the perspective is worth it. Don’t worry about being the next Glen, Glenn, Amybeth, Dean, Susanna, Jim, Jim, Maisha, Aaron, Arron, Chewy, Cyndy, Randy, Sarah, Greg, or Shannon – be the first, best, most inquisitive you. Tools don’t recruit – people do. What lessons would you like to pass on?